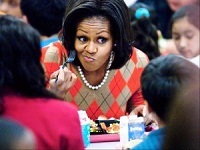 School menu monitor Michelle Obama has always put the welfare of America’s school children first. Right? Now, the first lady, in conjunction with the USDA and the 2010 “Healthy Hunger-Free Kids Act,” is on a one-woman mission to eradicate what she believes to be the greatest “threat to national security” — childhood obesity. Michelle Obama’s vision to promote healthier BMIs includes force-feeding federally-funded food to kids in school cafeterias and mandating that school-aged slackers “Let’s Move!” their rotund selves around the perimeter of the schoolyard during recess. As a result, voracious children who once enjoyed the freedom to choose sloppy joes for lunch are now getting their first taste of oppressive government regulation. In New York City, kids who reject the unenticing menu may even be forced to endure swallowing school-provided morning-after pills on an empty stomach. Overseen by Mama Obama, the new school lunch program is but a mere foreshadowing of what America is in for when Obamacare kicks in. Along with stringent regulations and increased paperwork, the costs of the life-saving government-dictated provisions are sure to go up while the portions and choices will go down. Another school food service worker said that “Two ounces of protein won’t cut it for high school athletes.” Maybe Michelle feels that if she can work out those impressive biceps on an empty stomach, high school athletes who need food-driven power to plow through those football dummies should quit complaining and toughen up. In other words, every child attending a publicly-funded school has been put on a USDA-enforced diet by America’s intrusive first lady. In Obama’s world it could be called “Sharing-the-Starvation,” where everyone gets to equally experience what it’s like to go hungry. Nick Blohm, a 6′ 3″/210-lb. varsity football linebacker at Mukwonago High School in Mukwonago, Wisconsin, is one of the hungry ones. Nick isn’t faring well on the same caloric intake as a 95-lb. flute player in the Pep Band. Neither are 581 of the 830 Mukwonago students who boycotted the hummus and edamame salad -laden cafeteria. In fairness, it could be that while Michelle’s expertise is in dietetics and kinesiology, math may not be her forte. The Mukwonago football slogan is: “To be the best outwork the rest.” The problem is that mathematically in order for Nick to “outwork the rest,” doing so on the caloric intake of a vegetarian won’t provide him with the oomph he needs. Nick has a plan, though; he thinks he can get around the unappetizing cafeteria fare by bringing a bagged lunch from home. What Mr. Blohm and his mom are probably not anticipating is a future where nannies Michelle and Tom possibly impose X-Ray scanning at cafeteria checkpoints for students attempting to sneak in unauthorized bagged lunches. In the meantime, Michelle Obama’s daughters Sasha and Malia, who attend the exclusive private school Sidwell Friends, are free to enjoy classic Caesar salad, cheese and all, and pepperoni flatbread pizza. Just as in most dictatorships, the elites remain unaffected by the very government impositions they inflict on everybody else. To quote our beloved President, this school lunch to-do is indeed a “teachable moment.” America should pay heed to what happens when a benevolent government worms its way into private choice and uses the excuse that it’s for the good of the citizenry. The truth is that what is currently taking place in school cafeterias across America is an omen of a future where the government that is currently regulating Tater Tots will one day be rationing health care.